Join us for a conversation about MADE IN CHINA: THE NEW EXPORT WARE with artists Sin-ying Ho and Robert Silverman. The discussion will be moderated by Leslie Ferrin, curator of MADE IN CHINA and director of Ferrin Contemporary. A tour of the exhibition with the artists and curator, will follow. Join us! Paul Scott will sign and present his new book Horizon, Transferware and Contemporary Ceramics. I’m So Fancy: Young Artists Take On Historical Ceramics with Garth Johnson, Curator of the Arizona State University Ceramics Research Center and Director-at-Large of the National Council on Education for the Ceramic Arts (NCECA). The Most Dangerous Imitations: Fake Chinese Export Porcelain of the 1920s and ’30s with Ron Fuchs II, Curator of the Reeves Collections at Washington and Lee University. Click here for downloadable pdf of press release. This group exhibition brings together work by several top ceramic artists represented by Ferrin Contemporary. Included will be pieces by Stephen Bowers, Claire Curneen, Steven Young Lee, Frances Palmer, Paul Scott, Bonnie Smith, Vipoo Srivilasa, Mara Superior, and Kurt Weiser. Form and surface merge in various constructions embodying elements of the human form, of animals, and of abstracted thought. The work in this exhibit gives a taste of the broad range of work being created in ceramics today. 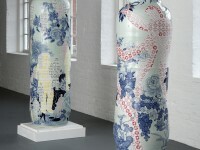 MADE IN CHINA examines the contemporary, ceramic-centric exchange between eastern and western artists and markets. Marked by ever-increasing cross-cultural collaboration, this contemporary ceramics movement emerging from China is urging a re-definition of today’s export ware. Exploring the growing cultural exchange between east and west. With increasing frequency, western artists are traveling to China to produce ceramic work using traditional Chinese methods. In this exhibition, Ferrin Contemporary brings together work that reveals the essential aspects of contemporary ceramics currently coming out of China. It is a dynamic relationship with appropriation and collaboration occurring in both directions. 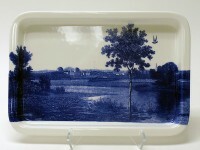 Click here to read Blouin Art Info on Made in China. Click here to read “Yes Virginia, Collecting Ceramics Can Be Hip” by Lynn Byrne of DXV American Standard. Click here to read “Marketplace | New York Ceramics & Glass Fair 2015” on CFile. Click here to read “Emporiums of the Waggish and Weird” by William Grimes in The New York Times. Click here to read “Ceramics Crack the Contemporary Art Market — Breaking the Mold” by Brook Mason in the New York Observer. Click here to read “New York Ceramics & Glass Fair 2015” by Andrew Baseman in Past Imperfect: The Art of Inventive Repair. Click here to read “New York Ceramics & Glass Fair 2015 at Bohemian National Hall” by Alison Ng in Asian in NY.